The 7-20-4 Hustler was one of two new blends by Kurt Kendall’s 7-20-4 cigars that was launched at the 2012 IPCPR Trade Show. These two new blends (the other cigar being K.A. Kendall’s Spider) expanded the 7-20-4 portfolio to four lines. The theme of 7-20-4 cigars has focused around bringing back old brands with a touch of nostaglia. The slogan of the company is “Smoke a Piece of History“. Like the other lines under 7-20-4, the Hustler represents an old brand name that has been resurrected by Kendall. The distinguishing characteristic about the Hustler is that it is a barber pole styled cigar. With the Hustler recently making it to the retailer shelves, I recently have had an opportunity to smoke the 7-20-4 Hustler. Kendall has done some very solid work with his brand, but the Hustler represents his best work to date. This cigar is nothing short of a home run. 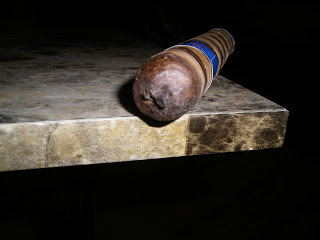 A barber pole involves wrapping a cigar with two different wrappers in a twisted fashion – almost like a barber pole. Back when I assessed the Viaje Holiday Blend 2012 Candy Cane, I mentioned that 2013 might see a big return of the barber pole. The Candy Cane was another blend recently released in a barber pole style. La Flor Dominicana has just launched its retail-exclusive Meaner Digger barber pole, and Asylum Cigars is planning on a 7 x 70 barber pole called the Ogre. I believe these four releases will start a trend in the industry over the next few months. Let’s take a closer look at the 7-20-4 Hustler and see what this cigar brings to the table. If you look across the 7-20-4 lines, Kendall has put together several multinational blends. The 7-20-4 Hustler falls into that category. For this cigar experience, I went with the 6 x 54 toro of the 7-20-4 Hustler. The barber pole style of the Hustler is noticeably different than many barber pole cigars in that it is more “tightly wound” than many other barber poles. The way the wrappers are laid on the cigar is that the Mata Fina (darker) wrapper is the base wrapper. The Ecuadorian Connecticut (lighter) wrapper is a thinner strip that is twisted over the Mata Fina wrapper. There is an oily complexion to the surface of the Hustler. There are also some visible veins – primarily from the Mata Fina wrapper. There also is a small pig-tail to the cap. Finally, the Hustler has some tight pack to it – it almost felt like a firm box-press. The 7-20-4 Hustler features two bands, both highlighted by a retro-style blue and red. The primary band features the black, pale yellow, red, and white 7-20-4 logo surrounded by gold trim. The logo sits on a field of the retro-style blue and red with some additional gold adornments. The footer band is retro-blue with the text “Hustler” in a retro-style red cursive font. Instead of pulling off the small tail on the cap of the 7-20-4 Hustler, I opted to go with a straight cut into the cap. Once the cap was removed, I proceeded to begin the pre-light draw. I found the dry draw notes of the Hustler to be quite enjoyable. There were notes of roasted coffee and pepper on the pre-light draw. There was some boldness to the flavors of this dry draw and I liked that. With the pre-light draw completed, it was time to toast the foot and see what the Hustler would deliver. I found the 7-20-4 Hustler to be a cigar to have a core set of flavor notes. What the 7-20-4 did real well was to deliver a nice harmony among these core flavors. The start to the 7-20-4 Hustler continued the roasted coffee and pepper flavors found on the pre-light draw. These notes were joined by some background flavors of cream and natural maduro sweetness. The maduro sweetness evolved a bit during the first five percent as it changed to a citrus flavor. This citrus flavor had a little bit of sourness to it (not a negative in this case). At times the sweetness also had a little bit of cherry flavor – and this was something that was present throughout the smoking experience. In the early stages of the smoke, the coffee, citrus, and pepper fused nicely together making for some excellent flavors early on. Midway through the first third, the citrus sweetness and spice became a little more prominent than the coffee notes. It wasn’t as though the coffee faded into the background, it is just that the citrus and spice notes were bolder. As the Hustler moved into the second third, the flavor profile of pepper and citrus up-front continued. The coffee notes from time to time joined those notes in the forefront. As for the background notes, the cream was still there and was joined by some nut flavors. Toward the end of the second third, I saw the citrus sweetness diminish to a secondary/background flavor. This would leave the pepper spice up-front. The cream notes were still in the background and the nut flavors had dissipated. The coffee notes from time to time would join the spice up-front. Toward the last third of the cigar, the spice really took control. This Hustler definitely had a spicy kick on its finish. There was a little harshness on the finish, but overall there was still more spice than harshness. The resulting nub was ideal – firm to the touch and cool in temperature. The 7-20-4 Hustler is a well-constructed cigar and this is reflected in its burn and draw. The Hustler had a little bit of jagged-ness to its burn line, but nothing significant. I’d still categorize this as a relatively straight burn that did not require major touch-ups. The resulting ash was tight and white in color. While the ash was tight, there were a couple of minor flakes that did fall from the ash. The burn rate and burn temperature were ideal. When I first inspected the Hustler, I mentioned it was a tightly-packed cigar. I was a little concerned this could lead to a tight draw, however this was not the case. The draw was perfect on this cigar – and this is the type of cigar that is a joy to smoke. There was a little more strength to the 7-20-4 Hustler that I originally was anticipating. Brazilian tobacco typically does not overpower. I’m guessing the Nicaraguan fillers helped amp this blend up. I assessed the strength to be medium to full for the majority of the smoke. In the last third of this smoke, the strength does progress to full strength. The strength is going to sneak up on you with this smoke as I definitely felt it toward the end. As for the body, this cigar is loaded with flavor. The flavors are deep and robust. This cigar definitely fits what a full-bodied cigar should be. Given the flavors are so robust, I gave the body an edge over the strength. In regards to strength and body, my summation of the Hustler is that it is a cigar that will emphasize flavor, but not sacrificing anything in the strength department. If 2013 proves to be the year of the barber pole, the 7-20-4 Hustler is setting the bar very high. This cigar just seems put everything together so nicely. In the flavor department, I really enjoyed the flavors. There definitely was more spice and strength toward the end of this cigar, so this is something that should be taken into consideration when smoking this. 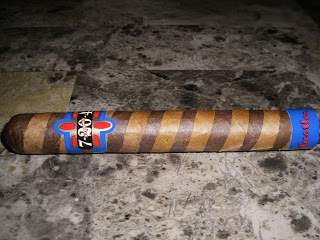 Overall, I feel this is 7-20-4’s best cigar to date (and there have been some good ones). It’s probably a cigar I would steer more toward an experienced cigar enthusiast as this cigar does have some kick to it. As for myself, this is a cigar I’d not only smoke again, but reach for a box for. Source: The cigars for this assessment were purchased from Smoke Inn in West Palm Beach, Florida.